Like many others, I’m curious about cauliflower and where it might lead me. Even with its sometimes strong cruciferous flavors, it has the ability to carry other flavors as well. I suspect it can be a real workhorse if its powers are properly unleashed—especially in lieu of starches and carbs. One evening recently I didn’t have much in the fridge except a few aging vegetables, eggs, and a partial bag of riced cauliflower. 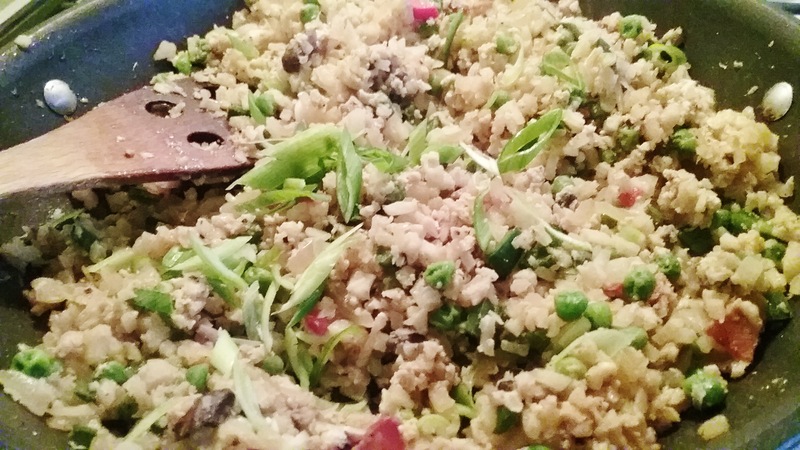 Since fried rice is the perfect venue for using up odds and ends, it is a handy meal to have in rotation. But, as much as I like fried rice, I rarely have extra rice sitting around. So, why not cauliflower? I went to town, thinking fried rice. I whacked a little bacon off my stash in the freezer and threw it into a hot skillet. I added a healthy combination of the usual suspects: onion, red pepper, peas and carrots… This is a stir fry that comes together in a hurry. The star here, of course, is the cauliflower, but with this cast of characters it blends right in with all the other flavors and is hard to identify as such. Other good news: it does not require much oil, and lacks the greasiness that can sometimes be an issue with fried rice. Further, it tastes surprisingly clean and is highly satisfying. For anyone not paying attention, I can see where this would be a great way to nefariously slip veggies into the mouths of non-believers. More good news, the cauliflower fried rice holds up very well. Should you have any ‘leftover’, it can be reheated in the microwave. 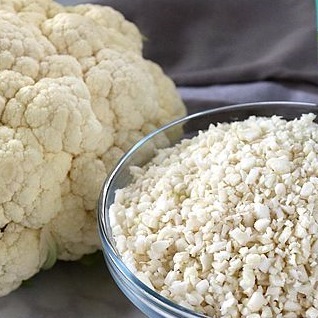 Use riced cauliflower or clean and cut the cauliflower into chunks. Place in food processor and pulse to chop the cauliflower until it resembles large grains of rice. In a medium-large sauté pan sauté the bacon over medium heat until it begins to crisp. Remove and drain the bacon on toweling. Leave 2-3 teaspoons of bacon fat in pan. Increase heat to medium high heat, add the onion and toss for 1-2 mins to soften; add the minced garlic and cook until aromatic. Add the red pepper and toss lightly. Move the vegetables aside, add the sesame oil then the cauliflower. Stir fry 3-4 minutes, until tender-crisp but not soft. Lower the heat to medium, add the partially defrosted vegetables, the soy sauce, and toss until the vegetables are heated. Return the bacon to the pan. Add ¾ of the green onion to the pan vegetables and move them all to one side. Pour in the beaten eggs and stir to form soft curds and then combine with the vegetables. Top with remainder of green onions and serve. Serves 3-4.